Our weather this week has definitely returned back to more normal-spring-like temps. Today was just downright cold after almost 90 degrees last week. We struggled to hit 60 and it was gray and dreary. Good thing my workout plan was to hit the gym. I started with a warmup on the elliptical then did giant sets for back and shoulders. I did 8 reps for each exercise and 3 sets for each giant set. Giant sets go by super fast, but they are no joke. I had to go down in weight for my lateral raises because my muscles were just too fatigued. Love tossing these in once in a while. We had some bok choy that needed to be used. Of course I could have gone the easy route and made up a simple stir fry. But we've really been wanting to try grilling it. Luckily, the sun did finally come out at the end of the day so it made it feel more like grilling weather - even if it was on the chilly side. All I did was cut the bock choy bunch in half lengthwise and gave it a good wash. I dried it off then microwaved for about 3 minutes before giving it a very light spray of olive oil and sprinkle of salt and black pepper. Place it on the grill and watch it closely, flipping once. 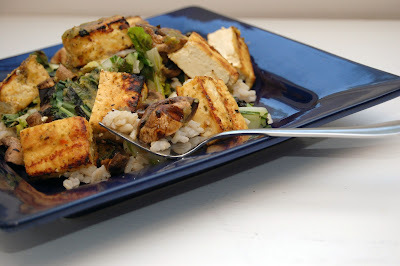 I decided to grill tofu and mushrooms as well to go along with the bok choy. 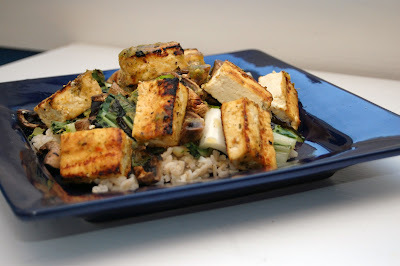 I made up a Pineapple Ginger Sauce to use as a marinade for tofu as well as a dressing. I let the tofu marinate for a bit then tossed it on the grill along with the mushrooms. Once the bok choy was done I cut it into smaller pieces then pile everything onto a bed of brown rice and drizzled with the Pineapple Ginger Sauce. Put all ingredients into a food processor or blender and puree. There were a couple of mistakes I made with this dish. I should have pressed the tofu rather than dry-searing and then let them marinate longer. I should have also put the whites of the bok choy over the heat and turned off the middle burner where the greens were. But, overall, not bad. The sauce turned out fantastic, so I'm definitely using that one again.